Because fruit trees often set more fruit than they can support and develop to full size, fruit should be thinned in the spring. Leaving too much fruit on a tree can also lead to limb breakage or alternate bearing. Although thinning reduces the number of fruit and total yield, it improves the size and quality of fruit. Fruit thinning can also reduce the spread of some diseases. The best time to thin fruit is when they are about 3/4 inch in diameter. If you thin too early, it's hard to see all the fruit. But if you wait too long to thin, the effect on large fruit size will be reduced. Thinning is typically done from early April (for early-ripening fruit) to mid-May (for late-ripening fruit). Peaches and nectarines should be thinned to about 5 to 7 inches apart along the branch. 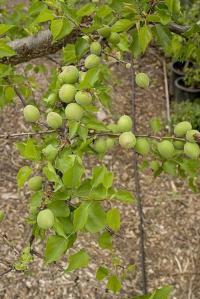 Apricots, plums, and apricot-plum hybrid varieties are generally smaller, so they can be spaced closer together. Thin apricots and apriums to 3 to 5 inches apart on the branch and thin plums and pluots slightly farther apart, to about 4 to 6 inches apart. Peaches and nectarines are produced along one-year-old branches. Thin them to 5 to 6 inches apart in April by twisting the young fruit rather than pulling them. There are two main ways to thin fruits: by hand or by pole. Thinning by hand is more thorough and accurate than the pole method, but it is much slower and may not be practical with larger trees. Remove fruit by twisting, cutting the stem with fingernails between the thumb and index finger, or using clippers, especially with apples and pears, which are hard to remove. 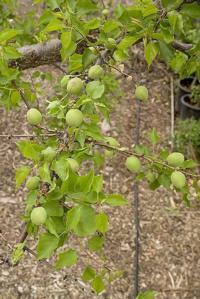 Pole thinning is mainly used on large stone fruit trees where hand thinning would be cumbersome or dangerous. It can also save a lot of time since it is much faster, and although it is less accurate, the results are often acceptable once the technique is mastered. Attach a short rubber hose, cloth, or thick tape to the end of a pole to reduce scarring or bruising of remaining fruit. Strike individual fruit or clusters or the base of the branch to remove a portion of the fruit. Unlike stone fruits, which produce one fruit per bud, apples and pears produce a cluster of flowers and fruit from each bud. Thin to one fruit per cluster. If the overall crop is light, two fruit may be left in individual clusters. Retain the largest fruit whenever possible. If the crop is heavy, fruit should be spaced no less than 6 to 8 inches apart. Use clippers to thin Asian pears (shown here), apples, and pears to one fruit per cluster, but fruit should be no closer than 6 inches apart.